The government released 10 models of innovative law enforcement and refined city management on Thursday. A police officer stops a man riding an electronic bike in Jing'an District, Shanghai, on May 12. The campaign of cracking down traffic violations was among the first 10 models of innovative law enforcement and refined city management released on Thursday by the government. About 100 programs had applied for the selection after it was launched by the government’s legal affairs office last year to promote standardized administrative enforcement practices. 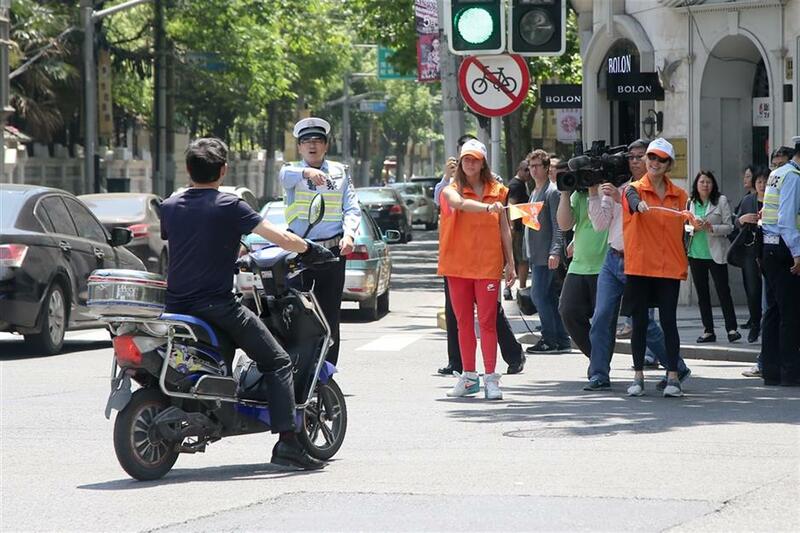 Local traffic police introduced the strictest ever traffic regulations and began strengthened crackdown on violations on March 25 last year to curb traffic problems in the city, such as ignoring traffic signs and random parking. Wang Liang, deputy head of the Shanghai traffic police corps, admitted that previous traffic law did lag behind due to the city’s fast development. He took the punishment on trucks that occupied lanes exclusive for passenger cars for example. “Trucks are so big and slow that they usually influence the traffic efficiency, and would easily cause accidents when car drivers change lanes,” he said. A violator was fined 50 yuan previously, which was not an effective deterrent as it was a mere trifle, according to Wang. But now, each violator would not only face fine up to 200 yuan, but also three-point deduction on the driving license for each violation. “Point deduction is a useful threat to truck drivers as they each have only 12 points and would be downgraded and lose qualification in working in the industry if all points were deducted,” said Wang, adding that such lane occupations decreased sharply in the past year. Ye Qing, president of East China University of Political Science and Law, said the winning programs were worth promoting as they were efficient solutions to new problems or challenges in big cities like Shanghai. Other winning programs included intensified inspections in restaurants and food industry, as well as specific procedures in compulsory demolition of illegal constructions.